I’ve only been blogging here for four months. (Here’s my first post.) The end of the year seems like a good time to have a bit of a look back – and forward. I didn’t know how much I needed an orange ink until this review. I mentioned in the review that I didn’t think I’d be able to use it for much – who writes with orange every day? Turns out – this girl! Wooo! I plan to continue my Fifty Shades of Grey (Gray!!) series in 2013. Oh..and speaking of plans for 2013…. I’m modifying my ink review lay-out. The look is completely different from what I have going on now, but there are also some important changes about the process I’ll use to evaluate inks. ..No more separate ink swabs on index cards. I’ve searched for high quality cards, tested a few, and have just not been happy with the quality. I’m sure I could find some stock and spend the time cutting them into tidy little squares, but that’s not how I want to spend my time. So ink swabs will be right on the review itself. ..This Pen + That Pen + The Other Pen = Inconsistent Results. I’m going to use one pen – the Lamy Safari for all of my ink tests. I probably won’t stick with the same nib width, though. I know, I know. Why the Safari? A couple of reasons. 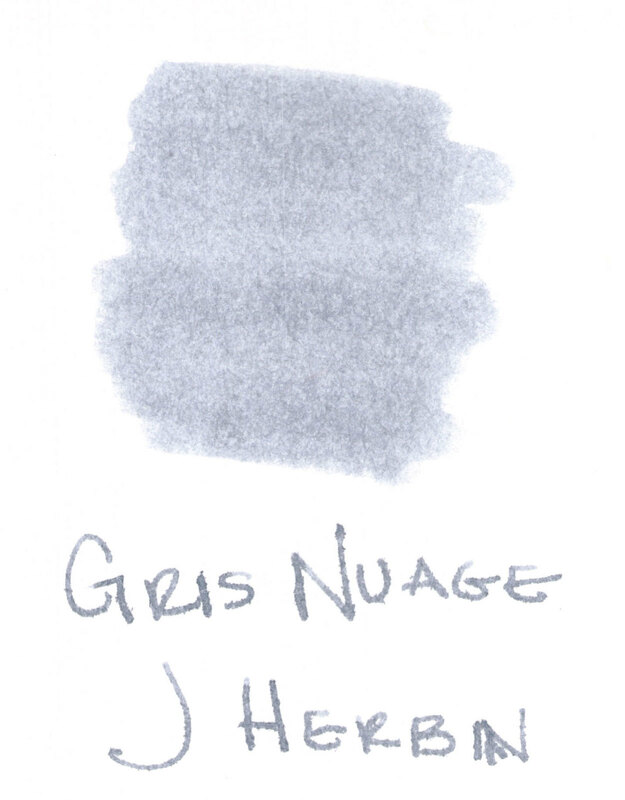 First, it’s a smooth writing son-of-a-gun that has given me good results with a variety of inks and papers. Second, I have several of them (trying to collect them all, yo) and this means I’ll be able to efficiently complete several reviews in one sitting. 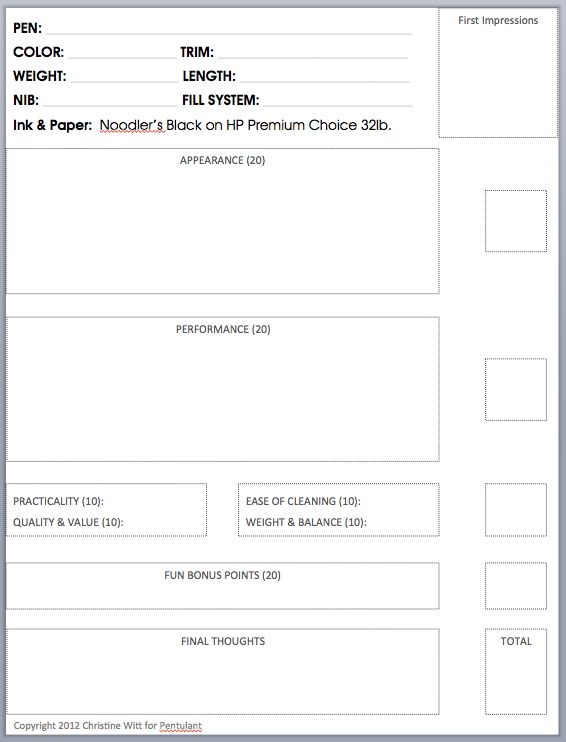 ..I’m changing my paper for all reviews to HP Premium Choice 32lb. I’ve been really happy with the Hammermill that I’ve used since the beginning, but it’s time to mix it up a bit and I’ve been reading good things about the HP. ..The four boxes going across the page? That’s the Compare Square section. 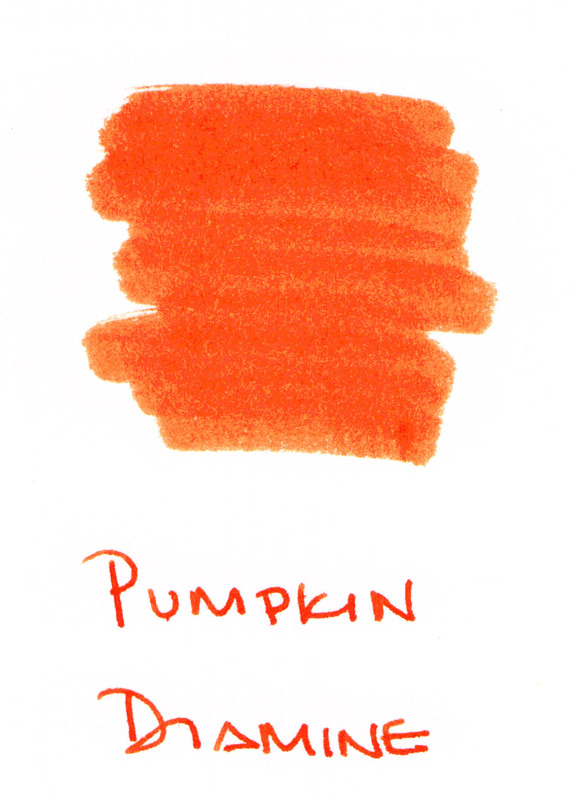 One of my favorite parts of looking at inks is comparing the ink to others. Sometimes, the other colors will be similar colors and maybe sometimes the other colors will be colors from the same line as the ink being reviewed. Let’s mix it up a bit in 2013, shall we? ..I’ve added a Highlight Test section. This is not at all related to my fancy new Montblanc Document Marker. 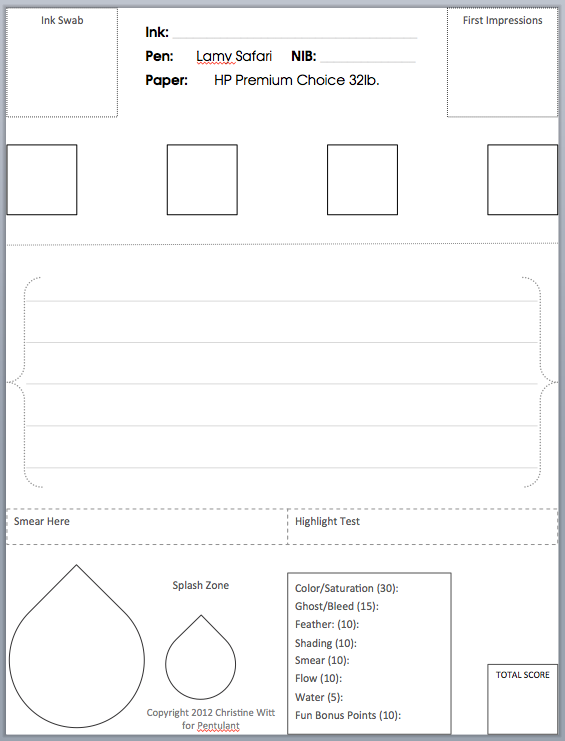 ..No more separate Water Test sheets. Again, the issue with index cards comes up. This also reduces the number of pieces of paper that I need to keep track of. Winner winner, chicken dinner. ..A scoring system. It’s my system, you don’t have to agree with it. Items are weighted – meaning that the more important a characteristic is (to me), the more possible points it will score. For example, color and saturation are important to me – so important that it’s worth about one-third of the total points. Whew..that’s a lot. There will be a period of transition. I work ahead a bit on ink reviews – completing the actual reviews ahead of time and then writing the blog posts as time allows. It will be a mixed bag until those are all done. Keepin’ you on your toes. You know what else is new in 2013? Pen reviews! I’ve been holding out on you, dear reader. I have a stash of pens that would make Caran D’Ache herself blush! And 2013 is the year I get over the weird shyness I have about showing them off to you. I always feel like I would be bragging or tooting my own horn too much – but then I think about what it’s like to be on the other side and I looooove looking at the pens that other people own or want to own. As you can see from the above form, I’m going to a rating system for pens. I’ve also decided to use Noodler’s Black for all the of the pen reviews. Noodler’s Black is well-regarded for its get-‘er-done attitude and it should work well in nearly all pens – freeing me up to write about the pen and not about pen, ink, paper combinations. I have a few other things up my sleeve for the coming year. Maybe I’ll do some give-aways? Start a Facebook Page? Invite guest writers? Track my handwriting improvement plan here? It’s a whole new year filled with opportunities! New opportunities. Not just for Pentulant, but for me – for you – for all of us. This entry was posted in EVERYTHING ELSE and tagged shameless self promotion by Christine (Pentulant). Bookmark the permalink.